Super Mario Bros. The Powerup Card Game is a card based game that has, admittedly, very little to do with Super Mario Bros. This card game has you stealing and trading cards in hopes of having the highest value at the end of the round. 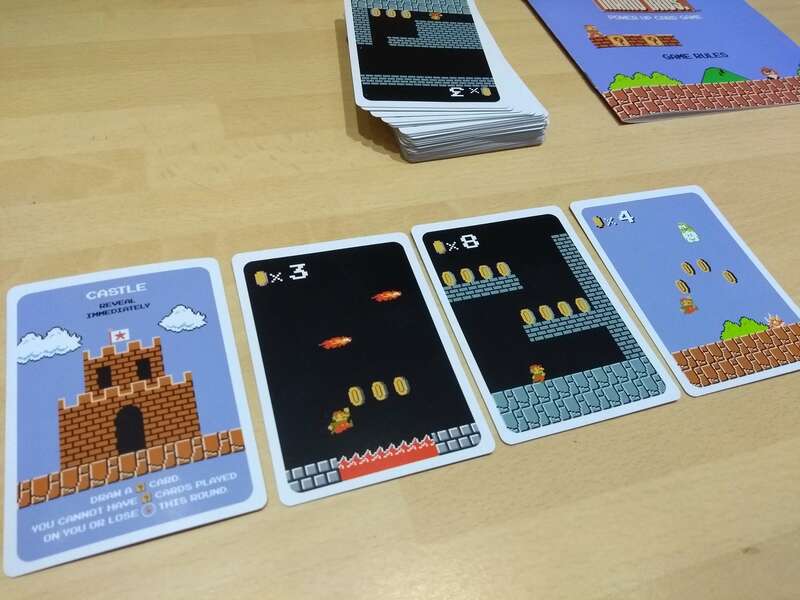 These cards each have assets and graphics from Super Mario Bros; in the form of Level Cards (some with castles!) and Question Mark Box cards (which are more like mystery cards). Apart from the physical appearance, this game is nothing like Super Mario Bros. You simply are trading these cards based on the level indicator (or amount of coins on a card) and trying to not lose any of your Mario life tokens. 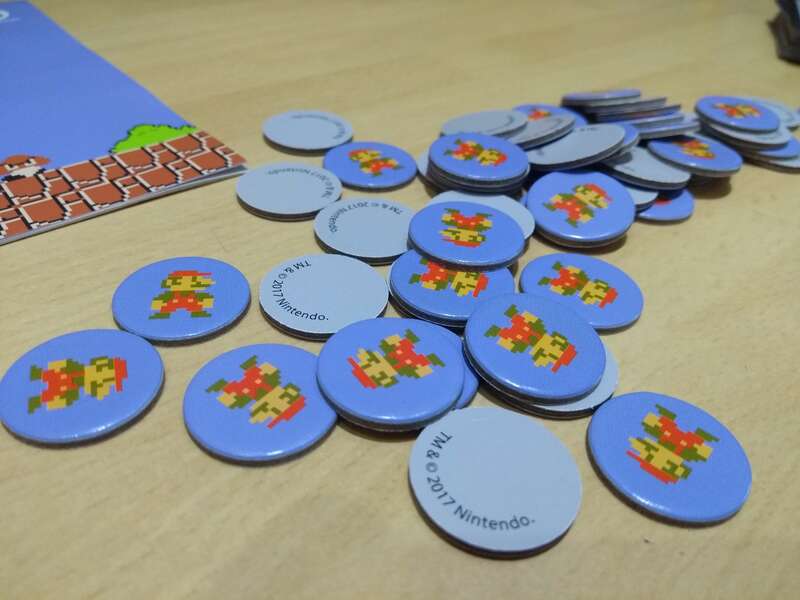 The game is quite small, containing 30 Mystery Box Cards, 52 Level Cards, and 50 Mario Life Tokens — as well as a rule book. Everything is themed to the video game it is based off of, even the box. The artwork is lovely and exactly what you’d expect. Mystery cards are written to tell you what each of them do, and most of the time make sense easily. All of the cards are pretty clear, apart from the fact that they call the number of coins the ‘level indicator’ instead of saying coin amount. At the start of the game, each player gets 5 live tokens and one mystery box card. They can look at this card to understand their advantage in the game. Once everyone is settled, the dealer gives each player a level card. You are not meant to share these cards with each other yet. If you get a castle card, you must reveal it immediately. These castle cards are very powerful in the game — they allow you to draw another mystery box card, they mean that no mystery block cards can be played on the castle player, and also that the player is immune from losing that round. The rest of the players need to attempt to not have the lowest card. The dealer gets to decide if they want to trade their card with the person to their left. They don’t know what this person has, so they must decide if it is worth the risk. The player to the left cannot refuse to trade and must give up their card. This then continues in the circle, with each player deciding to trade to their left or keep their card. If the person to your left has a castle card, you cannot trade with them and instead must keep your card. Once everyone has traded or kept their card and it gets back to the dealer, the dealer can then decide to trade the card with the top card from the level deck — another gamble. The dealer must reveal their card as well as the card on the top of the level deck before the level cards are set. Once the dealer is happy with their card, everyone flips over their level cards and reveals them to the group. If two players have the same level on their card, without modifiers, they each get to take a mystery box card. 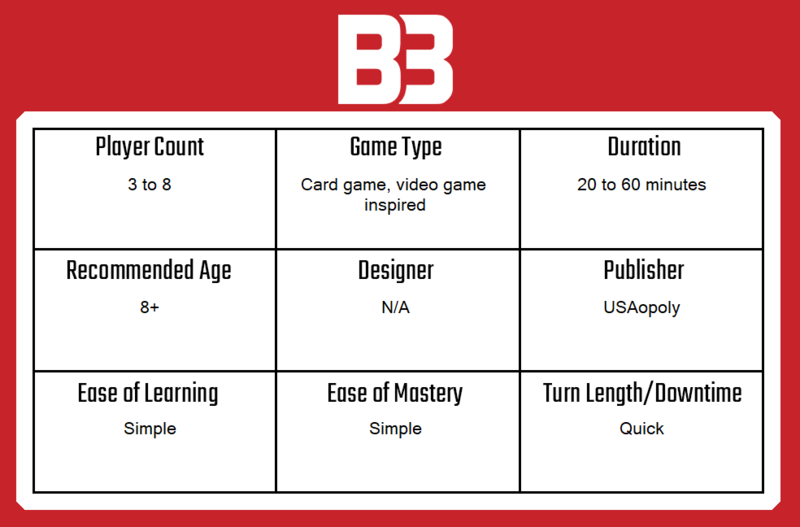 Players can then modify their level with mystery box cards, adding or subtracting to different card levels, and doing other actions depending on the mystery card they want to play. After everyone is happy with their mystery cards and a loser is found, they lose a life and the game restarts, with the next person taking the job as dealer. With all of that explained, the game itself is quite quick to play through once you have done a few rounds. We didn’t get through that many mystery cards, as the deck has only 4 castle cards and we didn’t happen to match levels often. I feel that having more of these mystery cards would make the game much more interesting. We also found that when someone got a low card, they would just trade it left, and it would always end up with the dealer. Then, they would trade it with the top of the deck. A lot of the game felt random — especially when you were out of mystery box cards. 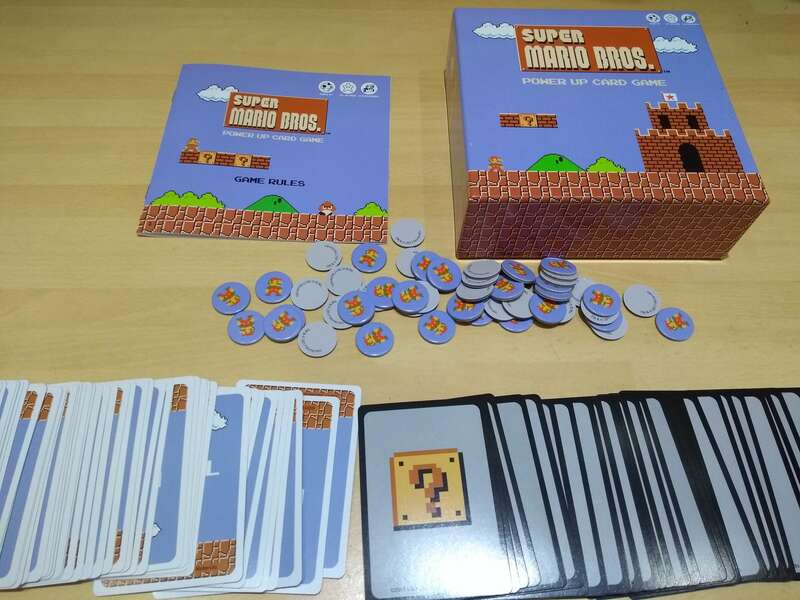 Also, once again, I need to say, it has nothing to do with Super Mario Bros.
Super Mario Bros. the Power up Card Game would really benefit from some house rules; specifically giving each player a mystery box card at the start of every turn or at least giving the dealer a bonus mystery box card. Basically, more of these cards really needs to be in play. I also would personally cut out some of the number cards — have half as many 1s and 2s as people automatically pass those left no matter what. This game is quick and easy to pick up, and might be a hit for children who are obsessed with Super Mario Bros., but I don’t think I will be playing this card game in the near future. A copy of Super Mario Bros. The Powerup Card Game was provided for review purposes. You can pick up a copy of Super Mario Bros. The Powerup Card Game on Amazon.